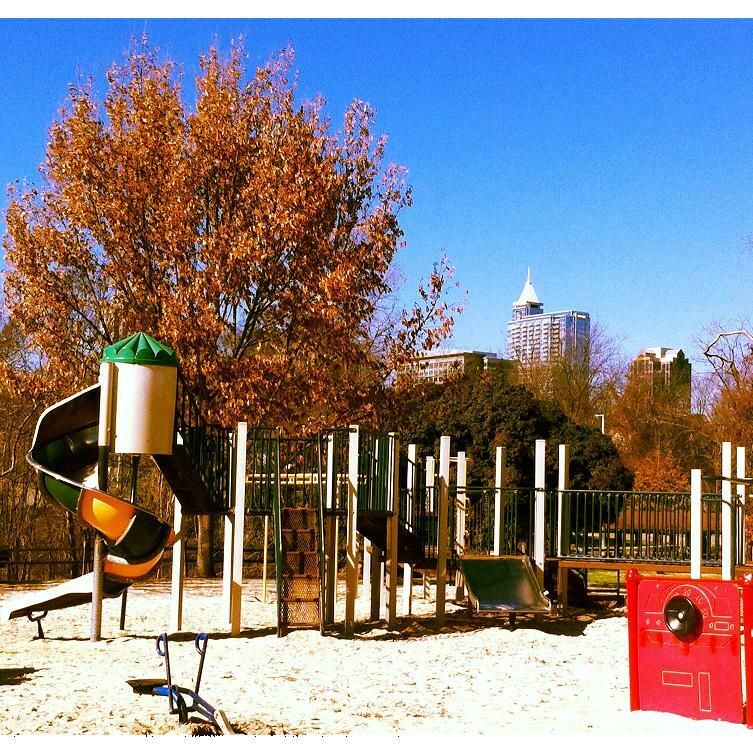 The playground at Chavis Park gets 4 out of 5 stars. 4 because an upgrade/remodel is planned for the near future, and we need room for improvement, right? My two-year-old particularly likes the suspension bridge on the play set and the large Jeep-shaped spring toy. I like Chavis because it lies in a nice setting; the green way and a creek are nearby, and of course the pool in the summer. There are also picnic shelter and plenty of park benches. It has a quite interesting playset (pictured) with multiple slides and a second one for the little kids. Spring toys, diggers, swings, see-saws – it is all there. The ground cover is sand, and I’m still undecided in the sand vs. rubber debate. Rubber is cleaner, but sand may be more fun. Chavis is easy to get to from downtown; walk east on Martin / Davie / Cabarrus / Lenoir as you like, and then south on Chavis Way until you reach the playground. There is supposedly a nice antique carousel in the round building, but it is currently closed for renovation and should re-open later this year in a new building. This entry was posted in Outdoors, Review by daddyweekly. Bookmark the permalink.